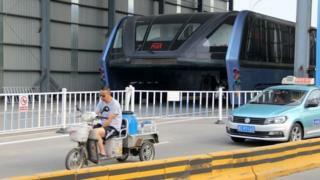 It seemed like a glimpse into the city of tomorrow - but China's "straddling bus" was riddled by doubts early on and now is headed for the scrap yard. The futuristic idea was a bus that would drive above traffic, allowing other commuter cars to pass underneath. The project was announced last summer to much acclaim but soon ran into feasibility and investment problems. Many of China's cities suffer from chronic traffic congestion so there's a strong hunger for ingenious solutions. The project faced strong headwinds from the very beginning and according to Chinese media, the test site is now being demolished entirely. Reports are saying that workers have already begun dismantling and removing the test track in Qinhuangdao. The idea of a traffic-straddling bus first appeared in China in 2010, but it didn't make much impact until the model was presented at the 2016 Beijing International High-Tech Expo. The so-called Transit Elevated Bus was touted as a revolution in public ground transportation, able to glide over traffic, literally lifting commuters from the daily grind of being stuck in their cars for hours. Yet only a few days after its much-lauded test-run in Qinhuangdao city, Hebei province, all test-runs had been halted and doubts began to emerge. Many doubted the vehicle would be able to manage curves or fit under footbridges in Beijing, and critics have asked how it will turn corners, whether it is strong enough to bear its own and passengers' weight and how long its battery would last. There was also confusion about whether the project had ever been approved by the local authorities and there was even suspicion it could be an investment scam. But the widespread interest in the idea did show that there's an appetite for ideas that could help big cities out of the grip of the daily traffic gridlock - even if this one appears to have hit a final roadblock.